Other important species that can be seen are; green, Little Green, Blue-throated Brown, Green-throated, Olive-bellied and Superb Sunbirds, Black-throated Apalis, African Blue Flycatcher, Red-headed Malimbe, Western Black-headed Oriole, Grey-throated, Yellow-spotted, Hairy-breasted and Yellow-billed Barbets. Eco-Specialists Tours Uganda Limited has some of the best bird guides in Uganda who have knowledge on different ecosystems in Uganda and on many occasions interacted with different bird watchers including Twitchers. Have a chance to bird with Ibrahim Senfuma and Robert Kungujje who have been birding for the last 10 years. 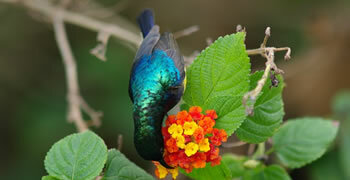 BIRD UGANDA WITH ECO-SPECIALISTS TOURS.